Environmentalism in the 21st Century: Where Did We Go Wrong? How To Lie With Maps (and data) - The Ecologist and Friends of the Earth turn the World Economic Forum's Environmental Sustainability Index upside down - US drops from 11th to 112th! Bush DOES Speak for Americans - How our arrogant, self-absorbed, irresponsible American culture reinforces and is reflected by Bush administration policy choices. NRDC Clean Air Network Censorship - I was recently kicked off of the NRDC Clean Air Network "air-mail" listserv for posting a message from Environmental Defense's Fred Krupp encouraging input to EPA's transition team. Two articles from Yes! A Journal of Positive Future - Diverse, Green, Beautiful Cities: A discussion with Carl Anthony and Corporate Futures: A discussion with David Korten and Paul Hawken. To your left is a portion of an Environmental Defense (ED) and Chemical Manufacturers Association (CMA) ad that the two organizations jointly released to annouce the voluntary High Production Volume (HPV) testing program. Partnerships like this and other business-friendly initiatives (commonsense, innovative permitting, reinvention, and the like) have grown over the last decade. The new republican administration is sure to build upon these. 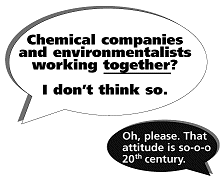 Large environmental groups have become increasingly professional, increasingly wealthy (see Losing Ground: American Environmentalism at the Close of the Twentieth Century) and the foundations that fund these groups are relatively free of any democratic oversight (see American Foundations: An Investigative History. It is time to begin discussing what environmentalism has become and what it should be in the 21st century. What works and what does not? What is left out? Who is left out? Is environmentalism democratic? Is funding democratic ... ? Can we get there from here? I have just begun to do research on this myself. I've listed some resources below and some books to the right from folks that have much to offer on the subject. These will be of help to us as we discover where we are, who we are, and where we are going. The lists still are not yet complete. These are not "my" lists. Rather, they reflect all the input I have received from you. The focus I envision includes all the barriers and the possible solutions to environmental-social problems/issues -- focusing on the causes rather than the effects. This led to creating two big catergories -- "Barriers / Solutions" and "Health and Ecological Issues." We can begin to ask why and how is such and such a barrier and how can it be turned into a solution with regard to the various issues. Some barriers may become solutions through some sort of modification, others through becoming their exact opposite. Many have their opposite. For instance, corporate prepared environmental education in the classroom is a barrier, but more enlightened environmental education is part of the solution. Same goes for the media, etc. Also, many items mean different things to different folks. For instance, some view sustainability as sustaining the natural world, ecosystems and the like while others view it as meaning sustaining human communities and the natural world. Please send any modifications/additions. If I have left out any of your additions, please resend. The next step, of course, is to boil the list down, removing duplications, overlaps, items that are too closely related and the like. A subscriber to env21-l suggested that the item "Environmental education" is only the tip of the iceberg saying, "I think it's important to consider ALL institutional education as a barrier/solution and not just this... In other words, education for the global economy, the current dominant discourse in education which dwarfs any incarnation of environmental ed, is inherently unsustainable and anti-ecological." This very helpful person pointed me towards C. A. Bowers' works. I have located reviews for his latest books, Let Them Eat Data: How Computers Affect Education, Cultural Diversity, and the Prospects of Ecological Sustainability and The Culture of Denial: Why the Environmental Movement Needs a Strategy for Reforming Universities and Public Schools and a syllabus for his course. This is a good starting point for our discussion of the barriers to environmental solutions. Closely related to the above is the question of whether or not the high costs of today's commercial internet -- sprawl, mindless irresponsibility, loss of capital, investment ruin, pollution, energy use, dislocation, increasing housing costs, eviction, and all the rest -- can ever be "balanced" by our more educational and activist uses of it. We have a new blog, feel free to post. I look foward to a lively discussion. Note: www.ert.org is no longer the correct url. Check http://www.environmentaldefense.org/links/ERT/for Environmental Defense's description of ERT and links. Recently ED responded to my email saying that C. Boyden Gray is no longer associated with ERT.